I know we’re only two days away from a three-day long weekend, but the last week has been a real slog of post vacation blues. Usually this is a condition I suffer, at most, a day or so, but I have not been able to let go this time. I crave more sun! More family time! More hours to lazily read zombie novels while the waves crash at my feet! Yes, while on vacation, I finished the two books I’d brought (unheard of!) and ended up downloading one at random from my Amazon wish list. As is the case with many of the titles collected there, I couldn’t remember where I had tagged it from or what it was about; all that mattered was that it looked like just the right level of popcorn fiction for the occasion at hand. Judging by the quick three-day turn around (read exclusively on beaches or while waiting for my turn to scrub sunscreen-cemented sand off), it was the right choice. It’s not an area of fiction where I’ve generally found much traction. While vampires, werewolves, and otherworldly spirits have long dominated the shelves, zombies seem to continuously slip by on the reader popularity scale. I think I’ve only reviewed one other even remotely similar title here, and that was a few years back now. I’m certain some of you are genre aficionados and will be able to point me toward some great titles, but it still stands that as far as monster fiction goes, the pickings are rather slim. It was with great joy, then, that I discovered Alice. Although the character is flawed in some very realistic adolescent ways, the writing was never less than compelling. The pacing was perfect for such a story, and even when I rolled my eyes at descriptions of muscle-bound teenage delinquent zombie hunters, I was also completely hooked. The kids Showalter was describing – burn outs and troublemakers and victims of great tragedies – did seem like the perfect army to fight the undead. They had that ideal combination of ridiculous unflagging energy and young bones that could take brutal beatings and realistically recover in a few days or weeks. The end result was a guilty pleasure that practically had “vacation reading” stamped on the cover. I didn’t even have to break a sweat to finish this before we flew home, and it was the perfect companion to that brief bit of summer I glimpsed during this interminable winter. For more about Gena Showalter and the White Rabbit Chronicles, head here. I’m trying to get through this zombie novel right now and having this realization that I’m not really into the whole zombie fad. I mean, I’m as sure as the next person that the zombie apocalypse is right around the corner – I just don’t find it that interesting to read about. Well I’ll be damned if this book didn’t change my mind. The recommendation to read it came from a source that has rarely let me down – John Scalzi’s “Big Idea” on his blog Whatever (http://whatever.scalzi.com/category/big-idea/) (and of course, as I went to get the link for you, my attention was caught by yet another book that will surely land on my kindle in a few minutes…). Scalzi seems to have the ability to pick books that I find devastatingly good (see The Magician and its heart-wrenching sequel The Magician King, by Lev Grossman), as well as those with delightfully plucky heroines (like the Norwegian tribute Icefall, by Matthew J Kirby and The Princess Curse by Merrie Haskell), who manage to cheer me up even during the long slow descent into winter. 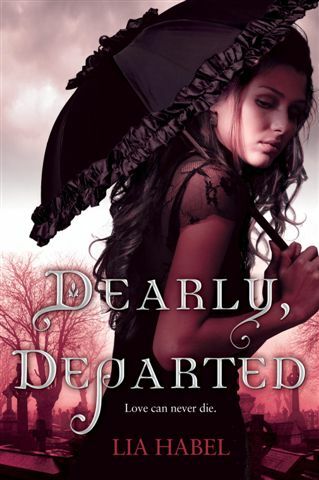 Dearly, Departed has been in my queue for a while, and by all accounts, I should have picked it up a month ago; it’s a young adult novel with a plucky heroine – two things I love! But something was stopping me, and that something, it turns out, was zombies. I’m not into horror. When I was a kid, and devouring anything and everything I could find in the fiction section of the library, I ran across a book, the name of which I can’t quite grasp, about a little girl who meets the ghost of another child who has drowned in a lake. It was called something like…Don’t forget Alice…and all these years later, an image from the end of the book, where the ghost tries to drown the girl who has befriended her has, well, haunted me. What can I say? I’m a wuss. I doubt at this point I’m going to outgrow my overactive imagination, so when confronted with the desire to read a book about flesh-eating monsters, I admit – I balked. Fortunately, curiosity has almost always outweighed common sense, and I decided to give Habel’s novel a chance. I’m glad I did. As Habel says in her Author’s note, “….thanks are due to everyone who ever made me love zombies or seriously think about the lessons that the dead and the weird have to teach us.” I think she sums up the experience for me nicely. I don’t like zombies, Victorians, or steam punk, but I found this book irresistible, in part because the message stretched far beyond any of those things. The first moment she had me was this, “Minutes later we were in Aunt Gene’s carriage, Pam compulsively adjusting her bonnet, me meditating upon all of the ways it might be possible to kill myself with the in-cab stylus (p 48).” That’s when I knew this girl, Nora Dearly, and I were going to get on just fine. I admit I’ve always had a weakness for girls who can’t find it in themselves to bend to the horrible, repressive (or even just horribly boring) standards of their time. The long dresses, the staying silent, the chaste, dull, doll-like quality that the Victorian era forced upon women – let’s just say I would have failed miserably at keeping my mouth shut and doing needlepoint, and I can relate to the protagonist’s desire for a life beyond merely being a man’s wife.